Gounod’s supremely romantic adaptation of Goethe’s play stars Ramón Vargas in the title role of the aging scientist who enters into a bargain with the devil to relive his youth. 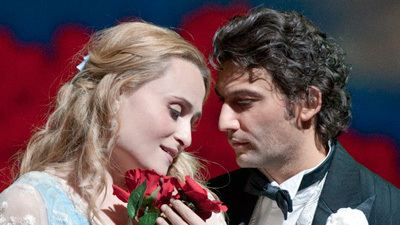 Ruth Ann Swenson is the innocent Marguerite, the object of Faust’s affection, and Ildar Abdrazakov sings Méphistophélès. Yung Yun and Karine Deshayes co-star as Valentin, Marguerite’s brother, and Siébel, her young admirer. Maurizio Benini conducts.